The astounding 6-day-old child already knows the human race is abhorrent and beyond hope. 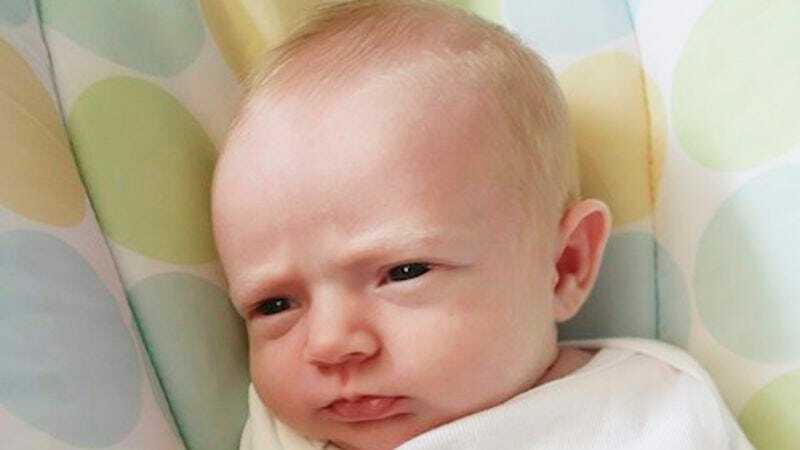 SCHAUMBURG, IL—In a turn of events that has stunned the worldwide medical community, local infant Nathan Jameson, born just six days ago, has become the youngest person ever to permanently and irrevocably lose all faith in humanity. “Considering he already comprehends harsh realities that many people spend their entire fleeting, shallow existences attempting to deny, Baby Nathan is quite the little miracle!” he added. Though he has not yet developed the capacity for speech, extensive cognitive testing has definitively shown that the shockingly perceptive 6-day-old fully understands and accepts that human beings cannot be trusted, that they remain far too ignorant for their opinions to be reliable, that a lack of self-awareness about their own destructive tendencies pervades the species as a whole, and that most are too ineffectual to successfully pursue even the shallow self-interested agendas that rule their lives. Sources said the early-blooming newborn was putting two and two together about the real nature of humanity even before leaving the hospital, where his first sensory experiences included the shouts of sick people arguing to get treatment they urgently needed, visitors staring vacantly at smartphones as they sat next to bedridden loved ones, televisions blaring the empty rhetoric and emotionally manipulative appeals of political advertisements, and dozens upon dozens of pained, desperate cries, including his own. Local reports confirmed the baby’s disillusionment was only compounded by the fact that he spent his first days in the bleak and soulless suburban conformity of Schaumburg, IL, its empty consumerist non-culture allowing him to realize in record time that all human pursuits are cold, joyless, and devoid of any substantive purpose or integrity. “We’re awfully proud to have such a precocious son,” she added, her face displaying no genuine emotion. According to household sources, Baby Nathan has already noticed that his father, Michael Jameson, resents the infant’s 3 a.m. crying, feels more trapped than ever in his sham-marriage now that he’s a father, and is inwardly building an ever-growing wall against the reality of his own life one mid-afternoon cocktail at a time. “My God, what a depressing development,” she added. At press time, there were unconfirmed reports that Baby Nathan had used the wind-up mobile above his crib to hang himself.